Fluoridating public water supply generates controversy throughout the world. Fluoride can be ingested through foods that are processed using fluoridated water, fluoridated toothpaste, and even drinking black and green leaf tea (mature tea leaves contain as much as 10 to 20 times the fluoride levels of young leaves from the same plant),10,11,12 but perhaps the largest contributor to human fluoride intake is fluoridated water supplies. Fluoride is the simplest anion of fluorine. Its salts and minerals are important chemical reagents and industrial chemicals, primarily used to produce hydrogen fluoride for fluorocarbons. Fluoride ions resemble the hydroxide ions in charge and size, and they occur in several minerals, particularly fluorite. In water they are only present in trace quantities. The soft, colorful mineral boasts a distinctive bitter taste but adds no color to fluoride salts. Anti-fluoridation efforts have been increasing throughout the U.S. in recent years. If desired, communities can remove fluoride from water through properly designed and maintained water filtration equipment. Equipment can be installed in areas with fluoridated public water supply or with private wells that have naturally occurring fluoride in the water. The water fluoridation controversy arises from political, moral, ethical and safety concerns in public water. While some countries, particularly in Europe, have ceased water fluoridation, the controversy persists in others. Those opposed argue that water fluoridation might cause serious health problems, is not effective enough to justify the costs, and has a dosage that cannot be precisely controlled throughout the water distribution system.1,2,3 Proponents point to reduced cavity rates among children, but several European countries have seen cavity rates stay the same or decline after ceasing fluoridation in water supplies. Additionally, some argue that children who do not have regular dental check-ups or brush their teeth with toothpaste containing fluoride, more typically in poverty stricken areas, benefit from a fluoridated water supply. The fluoride controversy will likely continue for many years to come. As more empirical data emerges, hopefully more of a consensus will be reached, but people will likely remain on both sides of the fence for the foreseeable future. In the meantime, for those that would rather avoid it, developed and tested water technology can control the fluoride content of the water entering their own homes. “American Public Health Association Community Water Fluoridation in the United States.” Oct. 28, 2008, http://www.apha.org/advocacy/policy/policysearch/default.htm?id=1373. “Recommendations for using Fluoride to Prevent and Control Dental Caries in the United States.” Centers for Disease Control. Aug. 17, 2001, http://www.cdc.gov/mmwr/preview/mmwrhtml/rr5014a1.htm . Autio-Gold, J. & Courts, F. “Assessing the effect of fluoride varnish on early enamel carious lesions in the primary dentition.” The Journal of the American Dental Association. http://www.jada.info/cgi/content/full/132/9/1247. Parnell, C.; Whelton H.; & O’Mullane D. (2009). “Water fluoridation.” European Archives of Paediatric Dentistry. 10(3):141–8. PMID 19772843. Fawell, J.; Bailey, K.; Chilton, J.; Dahi, E.; Fewtrell, L.; & Magara, Y. (2006). “Fluoride in Drinking-water.” World Health Organization. Guidelines and standards. pp. 37–39. Fawell, J.; Bailey, K.; Chilton, J.; Dahi, E.; Fewtrell, L.; & Magara, Y. “Fluoride in Drinking-water.” World Health Organization. Autio-Gold, J. & Courts, F. “Assessing the effect of fluoride varnish on early enamel carious lesions in the primary dentition,” The Journal of the American Dental Association. http://www.jada.info/cgi/content/full/132/9/1247. Balbus, J.M. & Lang, M.E. (2001). “Is the water safe for my baby?” Pediatric Clinics of North America. 48(5): pp. 1129–52, viii. doi:10.1016/S0031-3955(05)70365-5. PMID 11579665.
van der Lek, B. (1976). “De strijd tegen fluoridering”. De Gids. pp. 139. Wong, M.H. ; Fung, K.F. ; & Carr, H. P. (2003). “Aluminum and fluoride contents of tea, with emphasis on brick tea and their health implications. Review.” Toxicology Letters, 137 (12): pp.111–120. doi:10.1016/S0378-4274(02)00385-5. PMID 12505437. Malinowska, E.; Inkielewicz, I.; Czarnowski, W.; & Szefer, P. (2008). “Assessment of fluoride concentration and daily intake by humans from tea and herbal infusions.” Food and Chemical Toxicology, 46 (3): pp. 1,055-1,061. doi:10.1016/j.fct.2007.10.039. PMID 18078704. Gardner, E.J. (2007). “Black tea — helpful or harmful? A review of the evidence.” European Journal of Clinical Nutrition. 61(1): pp. 3-18. PMID 16855537. Mark St. Hilaire is the president of H20 Care Home in Middleton, Massachusetts. He is a master plumber who discovered a passion for water treatment early in his career. He started solving challenging water problems more than 25 years ago when he founded AquaTech Water Systems in 1989. St. Hilaire merged his company with Atlas Water Systems in 1999. He managed the growing Residential Systems Division for Atlas until he purchased the group and founded H20 Care Home in 2014. Norm Marowitz has been in the water filtration industry for more than 20 years. Most recently he was the president of Region-X Inc., an RO membrane cleaning and DI resin regeneration facility based in Taunton, Massachusetts, which was acquired by Quench. Prior to this, he was the president of Atlas Watersystems Inc. based in Waltham, Massachusetts, which was acquired by Quench, USA in June 2014. His other previous experience includes practicing as a CPA and management consultant as well as senior management positions in other industries. Having graduated from Boston University with a BSBA degree, he also completed his MBA at Boston College. This article touches on a few issues, but neglects to inform the public about the hydrofluorosilicic acid reaction within the water system and piping is also known to leach lead from lead pipes, lead-based solders, and lead-based brass fittings; still found in water distribution systems today. Silicofluoride is also known to help facilitate lead uptake into our body and brain. Lead, the new scare tactic. David Fierstien, the new village idiot. Johndmac – You obviously either have no concept of how to interpret a paragraph, or you perfectly exemplify what appears to be a universal trait of fluoridation opponents – taking a statement completely out of context and distorting it to fit within the other fabricated contents of your copy and paste repertoire. Why don’t you read David’s entire comment and base your reply on that? The MCL for arsenic is 10 ppb. The math for jondmac might be a little over his head. What is a prescribed dose of arsenic? The point I was making in my response to you, is that you can take anything, a drug, anything, even arsenic, dilute it down to parts per trillion in water, and you can drink it with no worries. That is just a fact. Is this really beyond you? Please tell me that you are not just a monkey who has learned to type. Quit trying to divert attention with you arsenic obsession. This conversation started with a commonly prescribed drug, Sodium Fluoride Drops, which is essentially water fluoridated at 500 mg/L (ppm). 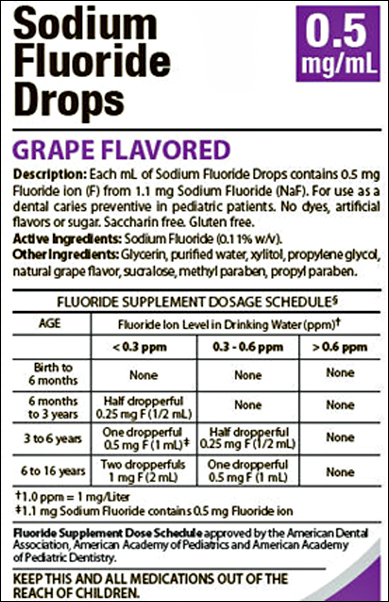 If their drinking water is not artificially fluoridated at 0.7 ppm, children 3 to 6 years old are frequently prescribed a half or full dropperful of this medication – 0.25 or 0.5 mg of fluoride per day – with the warning not to take more than one dose. When a half dropperful dose of Sodium Fluoride Drops is mixed into 12 ounces of water, its fluoride concentration becomes diluted. It is reduced from 500 ppm to about 0.7 ppm – but that glass of water still contains a 0.25 mg dose of fluoride. If their drinking water is fluoridated at 0.7 ppm, children 3 to 6 years old are encouraged to drink plenty of water throughout the day, even though they consume a 0.25 mg dose of fluoride with every 12 ounces of water they drink. As I read this, and correct me if I’m wrong – because I’m sure you will, drinking one total bottle of this stuff is safe. Therefore it is impossible to overdose on one bottle. “The total amount of Sodium Fluoride in a bottle . . . conforms with the recommendations of the American Dental Association for the maximum to be dispensed at one time for safety purposes.” Correct? Therefore your whole argument: “If their drinking water is not artificially fluoridated at 0.7 ppm, children 3 to 6 years old are frequently prescribed a half or full dropperful of this medication – 0.25 or 0.5 mg of fluoride per day – with the warning not to take more than one dose.” is completely moot. I talk about a dose of a prescribed drug, an everyday scenario. You guys distort by talking about arsenic. What is a prescribed dose of arsenic? Hysterical. You actually think you are somehow dissing me. It looks like the concept of dilution is way over your head. Who’s the village idiot? sounds like something Mr Jello would say. where is slott, and why isn’t he trying to peddle lead as an essential nutrient (like arsenic and fluoride)? After his debut verbal dump as “Information Director” for a handful of fluoroholics, he was recalled to Toothquarters and is being reprogramed to sound even less like a human being and more like the Michigan Department of Environmental Quality (MDEQ), the gold standard for water authority. Straw man, as New Zealand osteopathic quack, 1875 like to parrot. Flint’s water situation is irrelevant to water fluoridation. Detroit also fluoridates its water. Flint enjoyed, and enjoys safe water when using water from Detroit. The original question was about Dr. Slott. He is not affiliated with the MDEQ. water, or six glasses of water, the right amount fluoride for a 40 pound child? a 250 pound man? an infant? the elderly? wish. Leave the rest of us out of it. Please provide any evidence that optimally fluoridated water is dangerous for a diabetic, a person with kidney disease, or a fetus. A serious defilciency with fluoridation is that no one can predict the total dose of fluoride consumed because some drink one glass of water and some eight glasses. To get the complete truth read the excellent book , “The Case Against Fluoride” authored by three scientists, one an M.D. It contains over 1200 scientific references (over 80 pages), showing that fluoride is ineffective for teeth and causes cancer, thyroid & pineal gland damage, broken hips from brittle bones, lowered IQ in children, kidney disease, arthritis and other serious health problems. Medicating public water supplies with any drug violates the ethical principle of informed consent. We all deserve freedom of choice. Again, for the second time, please provide any evidence that optimally fluoridated water is dangerous for a diabetic, a person with kidney disease, or a fetus. To simply rattle off the title of a non peer-reviewed book, written by a well known, biased anti-fluoridationist, would not be considered acceptable documentation by any thinking person. Primary & peer-reviewed sources are acceptable. Your quote: ” . . fluoride is ineffective for teeth and causes cancer . .” Got any proof of that? The odd thing is that according to the National Cancer Institute, there is NO link between water fluoridation & cancer. U.S. There is no correlation in states between fluoridation and teeth health. best record of total teeth loss in the U.S. (13.1%). Similar poor results are found in Maine (79.4% and 30.4%), Delaware (86.3% and 25.8%) and other states. in serious health problems; damage to bones, brain, thyroid and much more. AGAIN FOR THE THIRD TIME NOW!!! Please provide any evidence that optimally fluoridated water is dangerous for a diabetic, a person with kidney disease, or a fetus. That is what you said, isn’t it? After many time where I provide the convenient source of all the truth about the ineffectiveness and health dangers of fluoridation, it is apparent you won’t read it. You are correct, I should always include cancer as a result of this toxic chemical. that fluoride in drinking water causes cancer. Here are a few. Go read them yourself. Again, James, for the FOURTH TIME, Please provide any evidence that optimally fluoridated water is dangerous for a diabetic, a person with kidney disease, or a fetus. I’m beginning to think you made that up. To your credit, you have at least made an attempt to provide some evidence of your scare mongering. What this means, James, is that it was a bad study that didn’t adjust for confounding factors. And the results have never been repeated. Nice try, though. In other words, a study of 103 cases is so small that it is meaningless. James Reeves, continued. . . In children, fluoridation causes enamel damage in 41% of all children (CDC data), a lowered IQ (Harvard University), and a fivefold increase in bone cancer (Dr. Bassin, DDS, Harvard University). In adults, generally the first disease from this toxic poison is damage to the thyroid gland. Is it a coincidence that thyroid cancer is now the fastest-rising cancer? Thyroid cancer rates are on the rise, increasing 240 percent over the last 20 years. It’s now the fastest-rising cancer in women. See for yourself. AGAIN FOR THE 5TH TIME NOW !!!! Please show me any proof that optimally fluoridated water is dangerous for a fetus, a person with kidney disease, or a diabetic. Now you are being a pest. Of course I understand the question. I refuse to perform your homework for you. I have give you the source, above, to learn all of the truth about the dangers of fluoridation. It contains over 1200 scientific references. You and everyone should read it. Yes, again, thank you for rattling off the title of a non-peer reviewed book that was written by a well-known biased anti fluoridationist. Thanks to a new study in Pharmacognosy Magazine, you might just have a means of countering all that fluoride you’re exposed to. mentions – prevent brain damage that is caused by fluoride. of Science in India. A decade was spent investigating just how harmful fluoride is to the brains and bodies of mammals. Ok, James, you are selling pseudo science natural health products. I get that. PLEASE SHOW ME ANY EVIDENCE THAT OPTIMALLY FLUORIDATED WATER IS HARMFUL TO A DIABETIC, A FETUS, OR A PERSON WITH KIDNEY DISEASE. FOR THE S-E-V-E-N-T-H TIME, I am asking you to be accountable for your outrageous claims. I guess that makes you a straw-man. You are making a complete fool out of yourself. By the way I’m still waiting for the safety clinical trails which you said have been done. Please list hem here __________________ Thanks. I have asked David countless times to list them but he seems very afraid to do that even though he could apparently silence us with that. I smell a rat. Listen straw-man. For the hundredth time please just supply one safety clinical trial that shows fluoride is safe for people of all ages and medical conditions. Sure, dickless, I’ll be happy to. As soon as you provide me with even one safety clinical trial that shows that drinking one glass of pure distilled water is safe for people of all ages and all medical conditions. You know what? I’ll even make it easier than that. Show me one clinical trial that shows ANYTHING is completely safe for all people of all ages and all medical conditions. Hang on here. Are you saying we are flying blind? You said fluoride is completely safe and you have the safety clinical trials to prove it. You just don’t want to give them to me, do you? That seems counterproductive though hmmmm. Come on my friend. Well that’s another of your outrageous lies, 1875. I never said anything on this planet is completely safe, and I never would say that. Ok, for the First Time now, please show me where I said anything is completely safe. Throw another exclamation point into your reply, 1875 – that will make it stronger. David is requiring proof of your outrageous claims – the fact that you can provide none is indeed a case built on straw. Straw man. James just asked about the dose. That’s why you are a strawman. It’s fun to watch 1875 in a complete meltdown, isn’t it. Do a search for fluoride side-effects for the peer reviewed scientific evidence that fluoride at the so-called “optimal” level can harm the brain, the thyroid, kidneys, teeth and bones. The fluoride ion is more toxic than lead and almost as lethal as arsenic. That’s why it’s the active ingredient in pesticides and rodent bait – fluoridated water just poisons you at a slower rate. Bottle fed babies get a toxic dose of fluoride – up to to ten times the adult dose per body-weight. heavily contaminated with heavy metals, arsenic and solvents. To illustrate the quality of his research methodology, do a search for UFO alien abductions. I like this one: “The fluoride chemical used is a waste by-product of the phosphate fertilizer industry and is heavily contaminated with heavy metals, arsenic and solvents.” Please provide evidence of this. If by “heavily contaminated” you mean fractions of a part per trillion in water, then ok. I wonder why 1875 so deceptively tries to scare-monger. Perhaps he is selling water filters also. 1875 is presenting the awful truth about fluoride, so he should expect ad hominem attacks from the promoters of this big money scheme. They try to demean everyone who presents the truth that fluoride is of no value to teeth and is dangerous to health. And when you drill a private well for your own home which provides water already containing the optimal level of fluoride for maximum benefit with no harm, to whom do you complain about the violation of your rights, God or Nature? This medication argument is a joke. You are, in essence, complaining about the possibility of having better oral health. You are demanding your God-given right to have poor oral health. That is not rational. And what’s more, you are trying to impose your irrationality upon other people who could really benefit from the chance to have less dental decay. Richard P. Maas, Ph.D Aquatic Chemistry, M.S. Chemistry, was a frequent consultant to the U.S. EPA on development and refinement of the federal Lead and Copper Rule. He is the author of over 60 original research publications on the dynamics of lead and arsenic in drinking water. I would love to see link for that. Not possible. 1.66 ppb exceeds the NSF limit, which is ten times more strict than the EPA limit.. If NSF found that to be the final product in drinking water, then NSF would not have allowed it. However, if the 1.66 ppb was found in the original fluorosilicic acid, then any arsenic that might result from this would be in the parts per trillion. And yes, according to the EPA, that minute amount of arsenic is completely harmless. I would be happy to show you the math for that but I doubt you are bright enough. johndmac – Obviously you do not understand the concept of dilution. But then you don’t understand anything else about the science of fluoridation either. A commonly prescribed drug, Sodium Fluoride Drops, is essentially water fluoridated at 500 mg/L (ppm). You want to explain the logic of this fluoridation “science” that encourages overdosing children with fluoride, an EPA-designated “developmental neurotoxicant”? I don’t see anywhere the precaution, upon which your argument rests, not to take more than one dose. I’m not sure I follow you here, your quote: “A commonly prescribed drug, Sodium Fluoride Drops, is essentially water fluoridated at 500 mg/L (ppm).” Could you please explain where you get 500 mg/l? Therefore, if each ml has 0.5 mg that equals 0.5 mg/l, or 0.5 ppm. I don’t see the word “drug” on this label anywhere either. No, it equals 500 ppm. One ml (milliliter) is one-thousandth of a liter. • Disclaimer: This drug has not been found by FDA to be safe and effective, and this labeling has not been approved by FDA. • Keep this medication out of the reach of children. Oh yeah. It was the end of a long day & I just glanced at it. I thought it said 0.5 mg/L, but that was incorrect. I was trying to get my head around the math in a period of about 5 minutes. You are correct. It says 0.5 mg/ml. I’ll do the math later, assuming about 20 drops per ml. But the reality of its not being found “save & effective by FDA” is simply that no one has ever applied for FDA labeling. The actual quote is: “Keep this and other medications out of the reach of children.” Johndmac, I think you were trying to pull a fast one with that one. hahha. I saw your toothpaste calculation and you have no mathematical ability. I guess your reading ability is on par with your math skills. It had nothing to do with toothpaste, genius. You said “Not possible. 1.66 ppb exceeds the NSF limit” Wow what a whopper. ppm). So that’s 4,900 ppb to 56,000 ppb arsenic. You have made a complete fool out of yourself David. Wow, you really are an idiot, aren’t you. And why exactly would anyone think that an osteopathic quack from New Zealand have any idea about mathematics, or the United States NSF for that matter? NSF limits are ten times more strict than EPA limits. That is a fact. That 0.28 ppb, which is the correct answer, is a far cry from your nonsensical 56,000 ppb. Moreover, 0.28 ppb is also 35.7 times lower than the EPA limit of 10 ppb. What a moron! Hahahaha!! Also thanks for admitting fluoridation does add the carcinogen arsenic. According to the National Academy of Sciences Risk assessment the lifetime cancer risk from 0.5 ppb is 1 in 10,000 and for 1 ppb it is 1 in 5,000 so adding 0.28 ppb arsenic will increase the risk of cancer. So say for example increasing arsenic levels from a background level of 0.5 ppb to 0.78 ppb by adding fluoride chemicals will give you a risk of approximately 1 in 7,800 an increase of 1 in 2,800. So for 200 million people you get an extra 5,641 cases of cancer.Or if you like increasing arsenic levels by 0.1 ppb arsenic will result in an extra 2,015 cases of cancer. That means you and you fellow travelers are causing cancer. Did you pick up on the words “average diluted concentration . . . 1.66 ppb?” If it’s already diluted into water, and the concentration is 1.66 ppb, then that does exceed NSF limits. So again, your reading ability is on par with your math skills. Now, even beyond that, I used your scariest number of 56 ppm As. You have some source that says arsenic in FSA ranges from 4.9 – 56 ppm. I’ve seen a few Certificates of Analysis, and the range is more like 1 – 2 ppm As. And that is a fact. So not only do you not understand mathematics, as we have already seen, but your starting point is completely skewered. Learn how to do some math, get a legitimate CoA, and then we’ll talk. Gee, who do we believe? Richard P. Maas, Ph.D Aquatic Chemistry, M.S. Chemistry, a frequent consultant to the U.S. EPA on development and refinement of the federal Lead and Copper Rule and author of over 60 original research publications on the dynamics of lead and arsenic in drinking water? The NSF limit for arsenic in drinking water is 1 ppb. This is ten times more strict than the EPA limit. If anyone found a sample of FSA with 1.6 ppb arsenic, NSF would not have allowed it to be used. That is just a fact. Read the NSF fact sheet provided if you don’t believe me. On the Fact Sheet you can see the results of testing from 461 samples. Arsenic was found in 50 % of the samples, with a maximum being 0.6 parts per billion. This is many many times lower than the EPA limit. These clowns, 1875 & Johndmac have provided a study from biased anti-fluoridationist Phyllis Mullenix in which she tested a WHOPPING 7 Samples – Wow! Compare that number with the 461 samples that NSF is disclosing. And they’re asking whom do you believe? Show where I did that. Yeah, that osteopathic quack from New Zealand did provide that lame study. But I said “these clowns, 1875 & johndmac.” You are both clowns too afraid to use your real names – I wonder why that is – probably because you are lying & don’t want to be held accountable. You clowns are all the same, so yes, you clowns did provide that study. However, you are correct. NSF is an international entity. I’m always willing to admit when I make a mistake. You guys can’t even do math. Where’s Steve Sleuth ? – the fluoride detective. bwahahahaha !!!!!! He is being reprogramed at Toothquarters. We call this recycling. It’s a big hit here in the United States. We call it village idiocy. It would be if 70 years of study and thousands of research papers have not clearly demonstrated that fluoridation is a safe and effective health policy. The only thing fluoride opponents recycle is the fabricated junk they copy and paste from anti-F sites. Anyone who follows these comment sections can see exactly the same anti-F propaganda and point-by-point refutations. The evidence that fluoridation at optimal levels is safe and effective is overwhelming. Fluoridation opponents ignore it, because if they read it with any sliver of open-mindedness they would be unable to continue their charade. You VIs had better tell the US National Toxicology Program to cancel its plans to conduct new laboratory studies to evaluate the effects of fluoridated water on developmental neurobehavioral toxicity, because you’ve known for 70 years that fluoridated water is safe. The late Dr John Colquhoun, Principal Dental Officer for Auckland NZ told me that the vote that was taken at WHO was a jack-up – waiting until known opponents of fluoridation wouldn’t be there . . . makes me wonder how much $$$$ has changed hands over this con! With photoshop, no understanding of science, and a complete disregard for the truth, you can turn any beneficial water treatment program into a false and twisted representation of reality. It is very important that when we talk about fluoridation to include the impact of cavities on health. The reason so many people support having adequate fluoride in water is that cavities are truly devastating to many people and they are 100% preventable. pay checks based primarily on implementing that policy. That is odd, isn’t it, in light of the fact that the World Health Organization actually endorses & supports water fluoridation. I mean, if the WHO data says it’s ineffective, why would that organization support it? So how do we explain this paradox? It’s easy. Here, quack 1875 is referring to a “graph” that was prepared by Chris Neurauth of the Fluoride Action Network. When you look at this graph, which spans 40 years, each country represented has one straight line, meaning only 2 points of data were used for each. It’s actually hilarious that FAN would expect anyone to take these crayon drawings seriously in light of the WHO’s own support of water fluoridation. This is a clear example of the deception & scare-mongering tactics that 1875 uses. You said “each country represented has one straight line, meaning only 2 points of data were used for each.” bwahahahaha !!!!! You obviously haven’t heard of regression analysis. Yes you do need an education. Every-time you attempt anything even remotely mathematical you make a complete fool of yourself. Rather stick to your knitting. Why would the World Health Organization in addition to over 100 other national and international health organizations support fluoridation as safe and effective if it is not? Why, in spite of the alleged overwhelming evidence against fluoridation, would the American Academy of Pediatrics (with over 62,000 members) – an organization committed to protecting and improving the health of children – make this statement, “Water fluoridation continues to be one of the most important tools in our toolbox to prevent tooth decay in children and adults. Hundreds of studies have affirmed community water fluoridation as a safe, equitable, and cost-effective way to protect the oral health of the population.”?? Logically, why would the membership not question this statement (or initiate a mutiny) if they had any concerns? I have yet to hear a reasonable explanation. Except perhaps that the overwhelming majority of experts in the fields of science, dentistry and medicine are correct in their interpretation of the evidence and fluoridation is, IN FACT a safe and effective health initiative. If you have ANY concerns about fluoridation, I encourage you to do your own research and talk to some scientists and health experts who accept fluoridation as safe and effective. Things take time to change Why was there lead added to gas if it wasn’t safe. Why did dentists and doctors advertise cigarettes. The list is endless. Obviously all the countries that stopped fluoridation don’t believe the WHO either. Fluoridation is not safe for everybody. It’s incontrovertible. Over 70 years of studies have overwhelmingly supported fluoridation as safe and effective. The ONLY individuals who have developed a severe case of fluoridephobia are a relatively small group of passionate, biased activists who have determined they do not want fluoride in the water and then set about to find or fabricate any “evidence” that could possibly support their agenda. Yeah look no evidence ! You must be a flat earther. If you’d lived hundreds of years ago you would have said there was no evidence the world was round. Fluoridation is useful in that regard. You’re just another village idiot. OK – since you didn’t bother looking at the references posted elsewhere, you can review these at your leisure. How convenient that you failed to explain the odd paradox of the World Health Organization fully supporting water fluoridation, while the concocted graph that the Fluoride Action Network created would have us believe the the WHO should discourage water fluoridation because of its own data. Please explain this odd paradox, genius. I think that is a question you should ask the WHO. Let us know when you get the answer. Thanks. If that’s not clear enough for you, you have a major problem. And yet the only evidence you have provided that their data suggests that they shouldn’t support CWF is a contrived graph, prepared by the Fluoride Action Network. Again, more scare mongering from 1875, New Zealand osteopathic quack. Well, first you are suggesting that fluoridated water is a medication. Even your own, New Zealand High Court specifically said that it was not. The U.S. Supreme Court, on the other hand, wouldn’t even waste it’s time on this question. 13 times this issue was brought before the Supreme Court, and 13 times they refused review of the issue for lack of merit. Then of course, 1875 wants you to forget that there is already fluoride in all drinking water. There is also calcium and iron in drinking water. Why doesn’t Nature allow us the right to choose how much iron or calcium we ingest? Isn’t that a violation of our rights also? The only thing that water fluoridation does is top off the existing amount of fluoride to reach maximum benefit, with no harm. This is called the optimal level of fluoride. Moreover, when municipalities practice water fluoridation, fluoride levels are checked on a daily basis from several points in the distribution system. When cities do not practice water fluoridation, fluoride levels are checked once per year. That in itself is a clear advantage. In 1995, Dr Phyllis Mullenix published an often quoted study suggesting that fluoridated water could cause behavioural changes. In her study, rats fed up to 175 parts per million of fluoridated drinking water became hypoactive (couch potatoes) and those whose mothers were injected with fluoride while pregnant became hyperactive after birth. The fluoride levels used were far higher than those found in fluoridated water, and her conclusions were widely criticized. The new editor of the highly respected journal that published Mullenix’s unrepeated study says its author has demonstrated an alarming pattern of making scientifically unsupported arguments. “Nobody else could ever produce (results) consistent with Phyllis. That gave me a sense at the time that Phyllis has a tendency to get rather odd results,” said Dr. Charles Vorhees, editor-in-chief of Neurotoxicology and Teratology and a professor in the Development Biology Division at Children’s Hospital Research Foundation in Cincinnati who worked with Mullenix on a separate study. “My sense is that Phyllis has had a very troubled scientific history.” Mullenix later claimed to have been fired from her position at the Forsyth Dental Institute three days after announcing that her paper was to be published, but the institute’s director said that he had no knowledge of the acceptance of her paper prior to the time she left, and said that Mullenix was dismissed because of problems with the quality of her work. hahahahaha. Conspiracy theories galore ! Typical evidence provided by fluoridation opponents. I’m still waiting for the safety clinical trials which you said are available. Please list them here __________________.Thanks.